Microsoft announced on Wednesday that more than 45 new apps will be making their way to the Xbox 360 and Xbox One console, and many of them will be opened up to all users where previously a Live Gold membership was required. Some of the apps include Vine, HBO GO, ShowTime Anytime, Comedy Central, Major League Gaming (MLG) and a customized version of Twitter designed to work with your big-screen TV. 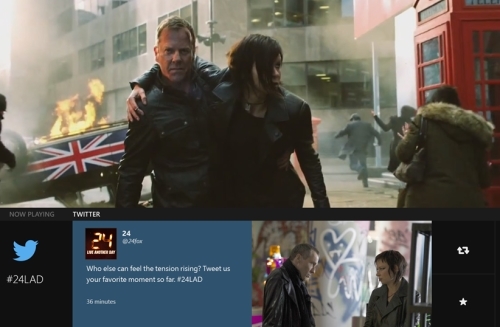 The enhanced Twitter experience allows you to see Tweets in real-time along with the show you’re watching and will integrate with the television program guide to see what shows people are tweeting about. Vine will also be integrated to watch alongside your display while gaming. Microsoft has announced on Tuesday that it is now offering the Xbox One gaming console without the motion tracking Kinect add-on. This is an interesting move for Microsoft, undoubtedly in an attempt to boost sales. The Kinect was a major selling point and a differentiation with competitors. The console without Kinect drops the price down $100 to $399, putting it right inline on pricing with its major rival the Sony Playstation 4. 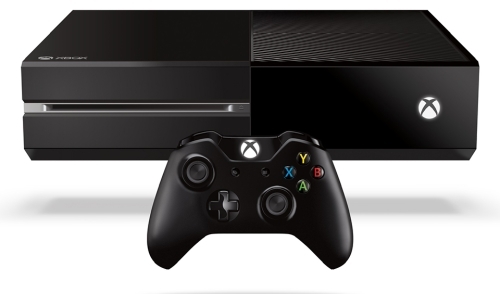 The Xbox One is available for pre-order now on Amazon at the $399 price. When it comes to high school graduation, most grads don’t want the sort of things that you would get on the average birthday. They want big-ticket items like computers, cars, and game consoles. Best Buy has a new bundle that gives the grad exactly what they want and saves the parent money. 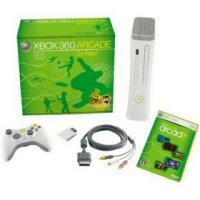 The bundle includes an Xbox 360 Arcade game console and a notebook computer. The Xbox 360 Arcade is the same old console we already know about. There are two notebook options with the same hardware. I have all three game consoles in my house and my son and his friends spend lots of time playing games around here most weeks. When it comes time to play games they all typically want to play the PS3 the most. The Wii is the second choice and they rarely play the Xbox 360. Despite the preferences of a bunch of 7-year-olds, the Xbox 360 has taken the top spot for sales in February according to NPD. 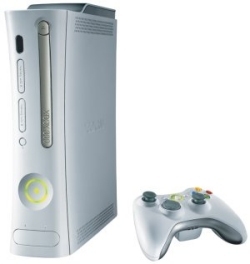 NPD’s numbers show that Microsoft sold 422,000 Xbox 360 consoles; the Wii was second with 397,900 units sold. Gaming consoles aren’t always the most beautiful things to look at. But it doesn’t have to be that way. Here’s proof. 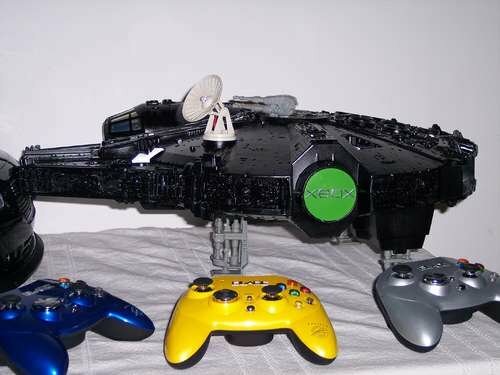 This XBEE (XB Elegant Edition) mod ups the consoles exterior look and makes the Xbox 360 stand out from the crowd. Upon seeing this beauty the usual cries of photoshop went up, but it’s actually real. It was designed by Sweden’s Industri Repro. Each case can have up to three 120mm fans to keep things cool and hey look, that’s no rrod. Why it’s green and full of life. 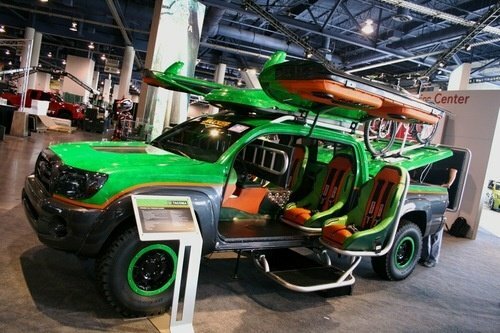 Toyota is clearly out to capture the hearts of gamers with the Tacoma All-Terrain Gamer (ATG) concept. It’s a Toyota pickup with four, yes four Xbox consoles inside, a Warthog from Halo and a Monster energy drink dispenser to keep you going during your intense gaming marathons. In the center cabin there are four 24″ LCD monitors from Samsung, which swing out to give each gamer their own display. Oh yeah and the outside is also cool to look at, despite all the action going on within. If you are an Xbox 360 owner who has been wishing that those fantastic X-Arcade controllers that PC and PS3 gamers have been able to enjoy for a long time worked on your console you are in luck. X-Arcade has finally announced that its controllers will work with the Xbox 360. 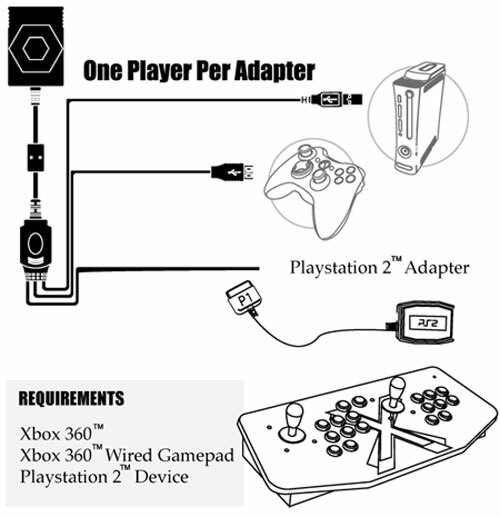 A new adapter called the X-Arcade PS2 to Xbox 360 adapter is now available that will let you use the X-Arcade Solo, Dual, or Tankstick with the Xbox. Strangely, it appears the adapter is an adapter for an adapter since you must have the PS2 adapter to play on the Xbox 360. Here’s something that will keep the spouses of gamers happy. 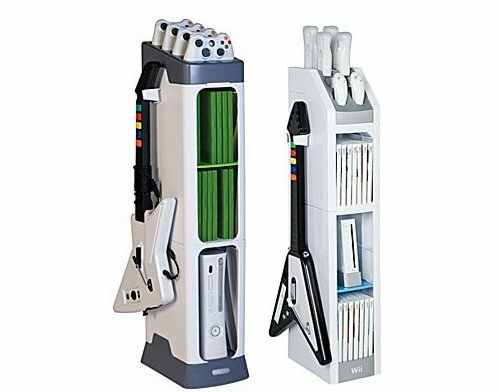 The Xbox Generations Gaming Tower and the Wii Aspect Gaming Tower are two pieces of actual furniture that are designed to keep your gaming consoles nice and organized. Both towers can hold up to 16 games, 4 controllers and the required guitar. The Wii Aspect Gaming Tower holds 4 Wii Remotes, 2 nunchucks, 1 classic controller and a guitar. Your wife will be happy that you cleaned up your act a little. Don’t you think? I am a big fan of video games and while they tend to cost at least $60 each, it’s still not a bad deal considering how long you can play a game. You can spend $60 at the movies and only be occupied for a few hours whereas a game can be fun indefinitely. SouthPeak Games has announced that its new game for the PC and Xbox 360 will support X Server functionality allowing players to run their own dedicated game servers on a Windows PC. Each X Server can handle up to 32 players at once allowing for large multiple player matches on the Xbox 360 console. Turtle Beach has been making headphones for computers and game consoles for a long time. The company offers all sorts of other products as well that help gamers and computer users listen to music and watch movies without waking the whole house. 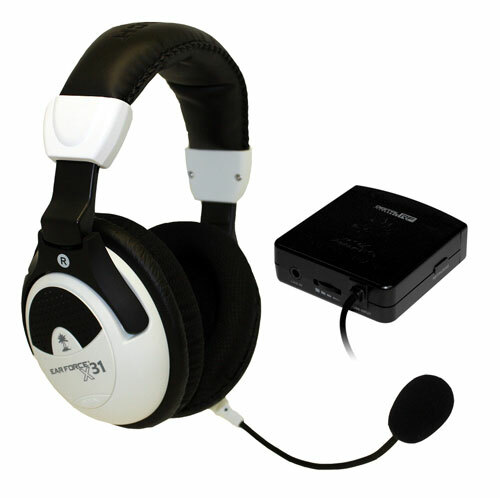 The latest set of headphones from Turtle Beach for the Xbox 360 is the Turtle Beach X31 stereo wireless digital RF gaming headset. The headphones are the replacement for the Turtle Beach X3 headset and allows for digital stereo sound to be sent without wires from the Xbox. External Blu-ray drive coming to Xbox? This one is interesting, even though we’ve heard it before. Just as Toshiba is announcing that it will be delivering a Blu-ray drive of it’s own, Microsoft could follow suit. At least that’s the word on the street. The big M might be readying a Blu-ray drive add-on for the popular Xbox 360 gaming console. The company did offer an external HD DVD drive before, built by Toshiba. The new drive is seen as more feasible, both because of Toshiba’s support and cost reductions, which could make a USB Blu-ray reader affordable. I am a big Call of Duty fan and while I prefer Modern Warfare to the World War II setting, the most recent Call of Duty: World at War game was lots of fun. I don’t like to play my shooters on consoles personally; I stick to the PC for this type of game. Lots of gamers prefer console systems though and Activision has announced today that Map Pack 1 for Call of Duty: World at War has hit a milestone. The pack has been downloaded over 2 million times combined on Xbox Live and the Sony Playstation Store. Dante’s inferno was one of the books I had to read in literature class back in the day. I can’t say it was one of my favorite books and I wished it were a movie instead so I didn’t actually have to read it. Students today can crib for the quiz with a new video game from EA based on the book. 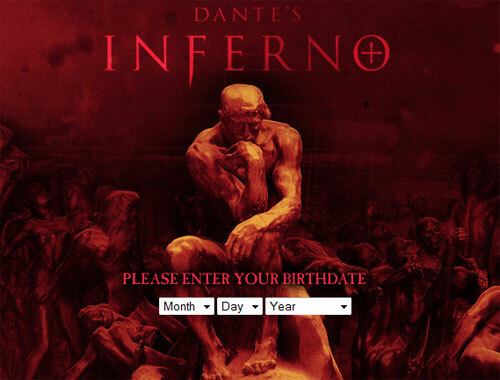 The game is based on part one of the Dante Alighieri classic, “The Divine Comedy.” The game will put players on a mission to move through the nine circles of hell including high school, college … I mean limbo, lust, gluttony, greed, anger, heresy, violence, fraud and treachery. I am an avid PC gamer and one of my all time favorite PC games was the original Max Payne. The shooter had an original story, great graphics, and some very innovative game play with its Bullet Time feature. The game was so popular it spawned a feature film recently that honestly sucked, not Marky Mark’s finest work. Rockstar has announced that Max Payne 3 is coming this winter, we can probably expect the game in time for holiday shopping. Payne is still out for revenge for the death of his family in the third installment from the franchise.